If you have email already set up on your computer, you can email invoices rather than print them right from inside QuickBooks 2016. And in this case, to email an invoice or credit memo, click the Email button, which appears on the Main tab of the Create Invoices window. 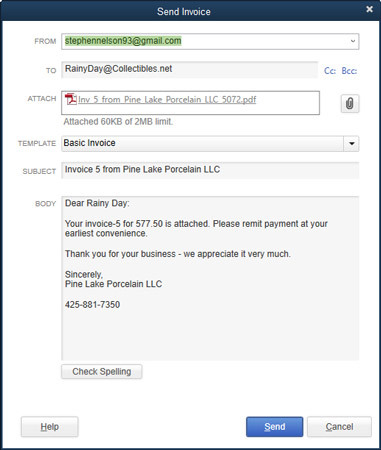 QuickBooks displays the Send Invoice dialog box. The Send Invoice dialog box. To send your invoice via email, enter the email address of the business that you want to bill or refund money to, edit the message as appropriate (make sure to click that Check Spelling button), and then click the Send button. If you don’t yet have email set up on your computer, you can click the Edit → Preferences command and select Send Forms to use a third-party webmail account (like Google Gmail) or the QuickBooks Email service. To tell QuickBooks about a webmail account, click the webmail option button, the Add button, and then when prompted, fill in the boxes on the dialog box that QuickBooks displays. To tell QuickBooks about any Intuit Email subscription you have, click the Check for Valid Subscriptions button and follow the onscreen instructions. You can also save the invoice as a PDF document and then use your regular email program to send the PDF to a customer.